When the sun starts coming out and the days start getting longer and life is just generally more lovely, like clockwork I almost instantly find myself needing to swap my black staples for shades of tan, beige and white. 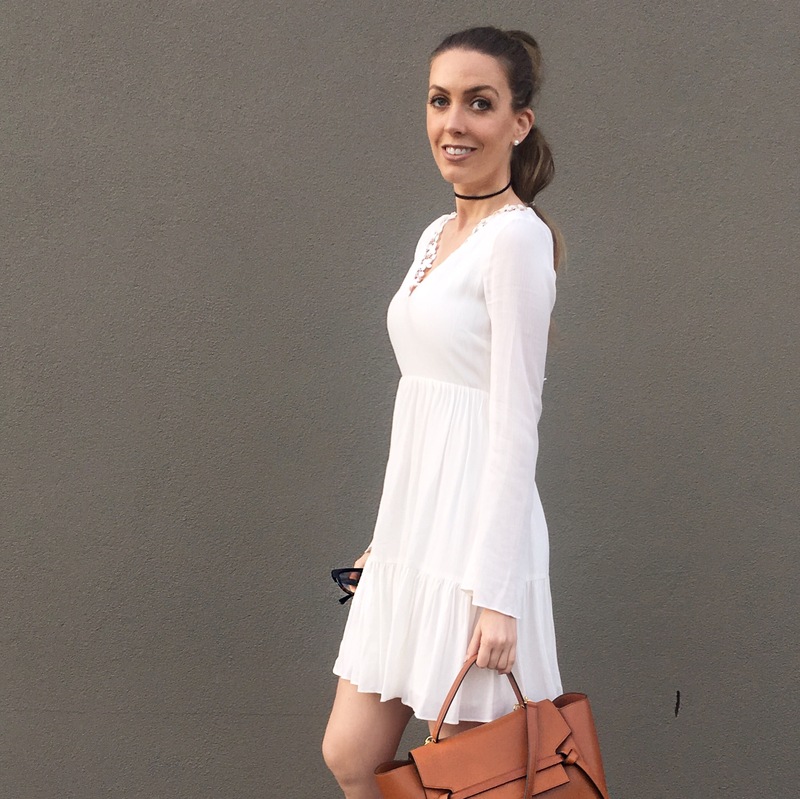 An LWD or Little White Dress is almost like the Spring/Summer daytime equal to the LBD and it is absolutely a wardrobe essential. This one is just a cheapie I picked up on sale at Sportsgirl last year and I love it, though obviously I will be on the prowl for a couple of new ones this season, something off the shoulder I am feeling! 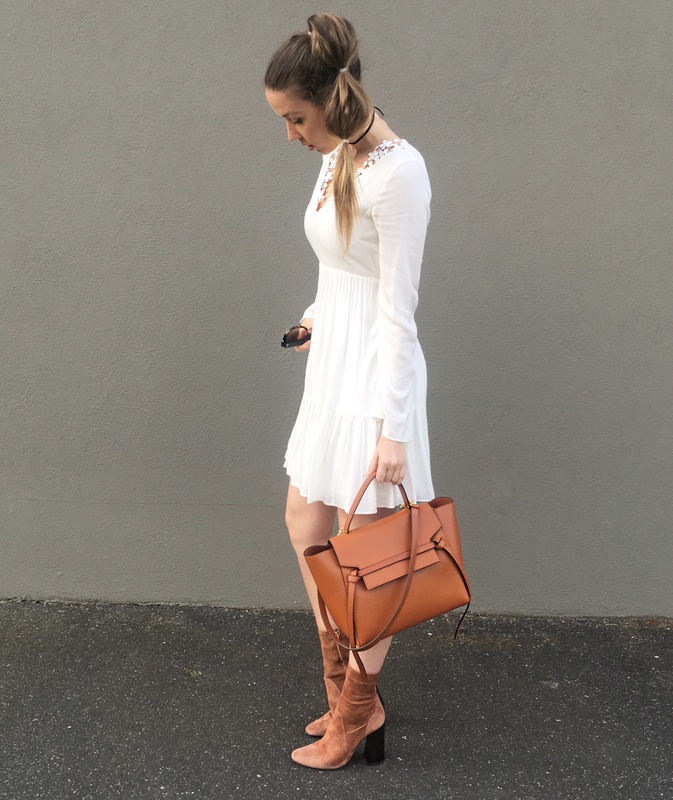 The trick with an LWD (and a LBD for that matter) is to always look for something with a little bit of interest, on this dress its the lace detail and the cut out at the back, it just elevates the look a little. This beautiful Celine belt bag joined my collection during my trip to Singapore earlier this year and I hadn’t really worn it much yet as I was busy living in black and bordeaux through Winter but it, along with my new suede Zara boots are now on high rotation and I must say I feel they are a good team. I would love to be able to afford to live in designer top to tow but I have to be realistic to my wage, so I think you have to choose carefully where to invest in your wardrobe. I like to have high end and semi classic accesories that will last year in year out and spend less on high street dresses and tops from places like Zara, Sportsgirl and Topshop, it is a great way to keep on top of trends without breaking the bank. Taking it to another level on this one I my choker is actually just a fine black shoelace wrapped twice around my neck and knotted at the back. I love ankle boots and a sleeved mini dress as a trans-seasonal combo as my feet and shoulders stay warm enough but I still feel Summery because my pins are out and I can wear pretty dresses. Choker: this is actually one of Matt’s spare shoe laces – very thrifty, I do actually want to buy a nice one though, add it to my long list of items to buy for Spring/Summer. Next > Hello October! Oh How I Love You.. The choker is wickedly clever. Nice look all over and you’re right about spending on good classic accessories and rotating seasonal garments. That dress is so pretty, the details are lovely and it looks great on you.